Much has been written about the gradual disappearance of traditional wagons in North America. 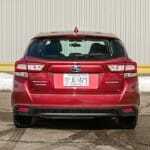 Interestingly, the compact car segment has seemingly survived this movement, offering a wide variety of choices to wagon or hatchback shoppers. 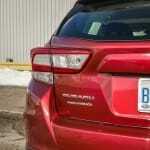 Our loyal readers know that all of us at DoubleClutch.ca love wagons for their unique blend of style, practicality, and car-like driving dynamics. We have worked hard to cover as many as we possibly can, hoping that we can instill the “#SaveTheWagons” message to you all! 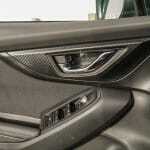 In the past year alone, we have covered many compact hatchbacks and wagons, from the popular ones such as the Mazda3 Sport GT (reviewed here) the Honda Civic Hatchback, the all-new Toyota Corolla Hatchback (reviewed here), and even a couple of the dark horses such as the Hyundai Elantra GT and Chevrolet Cruze Hatchback. This week, we borrowed a popular choice in the Canadian market, the 2019 Subaru Impreza Sport 5-door, equipped with a five-speed manual transmission. 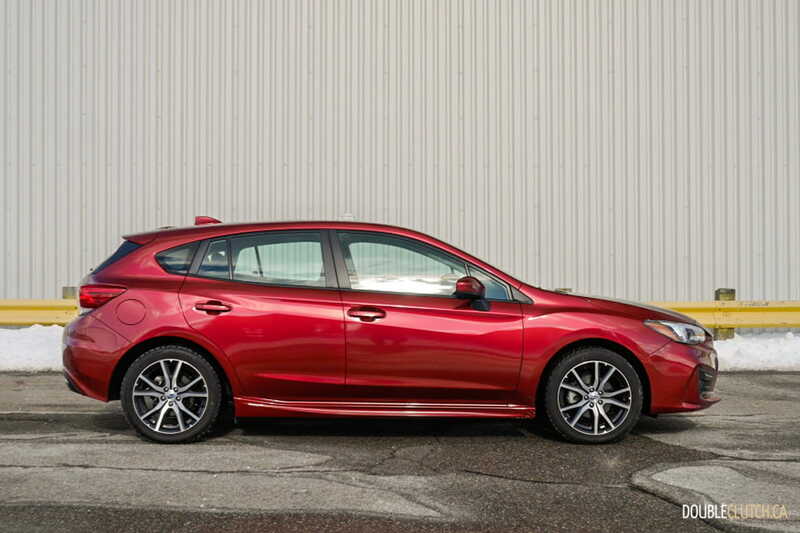 The 2019 Impreza 5-door painted in Crimson Red Pearl features a no-frills utilitarian design, with a pair of C-shaped LED daytime running lights, halogen fog lights, and steering responsive projector beam LED headlights. The long roof is slightly sloped into rear spoiler, giving it a bit of a fastback look. It is not going to win any beauty contests, but the Impreza 5-door does have a bit of a muscular tone, adding a dash of sportiness that is not found in many of its peers. 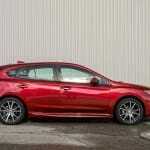 The Impreza Sport is powered by a 2.0L flat four-cylinder engine, which produces 152 horsepower at 6,000 RPM. Peak torque of 145 lb-ft. arrives at 4,000 RPM. 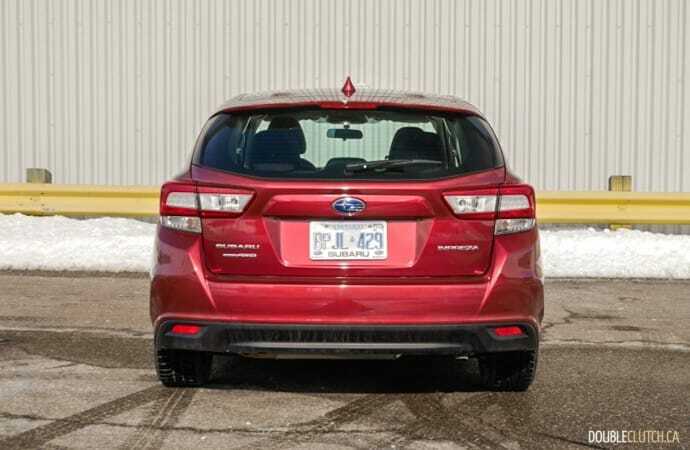 Our tester is equipped with a five-speed manual transmission that delivers power to all four wheels using Subaru’s symmetrical full-time All-Wheel Drive system. Thanks to short gearing ratios, the Impreza Sport gets off the line without much hesitation and it can easily keep pace with traffic. Clutch engagement is rather easy with moderate throttle tip-in, but unfortunately the dreaded Subaru rev hang is still here, leading to jerkier upshifts in the city and ultimately more clutch wear in the long run. 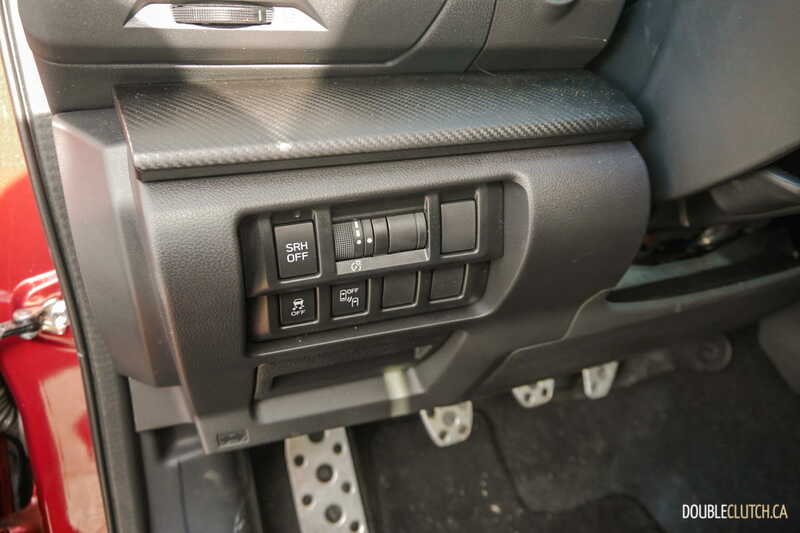 Those who are looking for smoother acceleration in the city should consider opting for the optional Lineartronic CVT with paddle shift controls. It’s a smoother application overall and despite the engagement a manual provides, the CVT is the better pick in this particular vehicle. 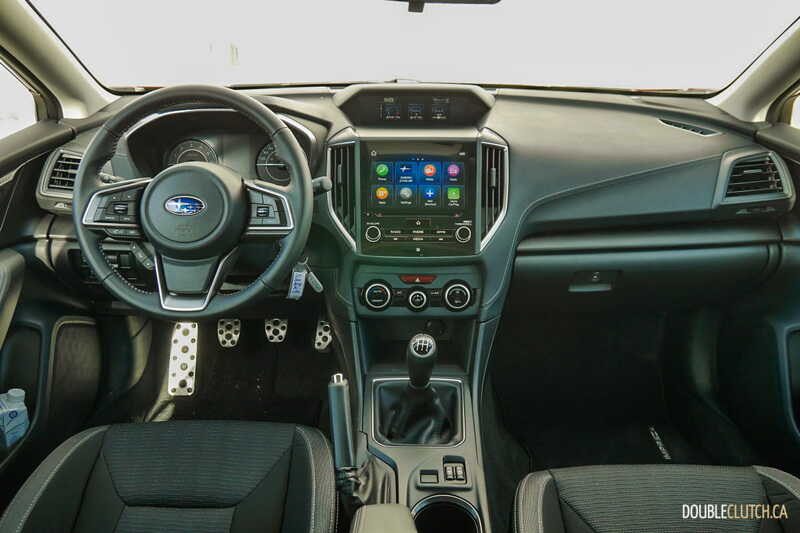 The 2019 Impreza Sport’s driving dynamics are a pleasant surprise. 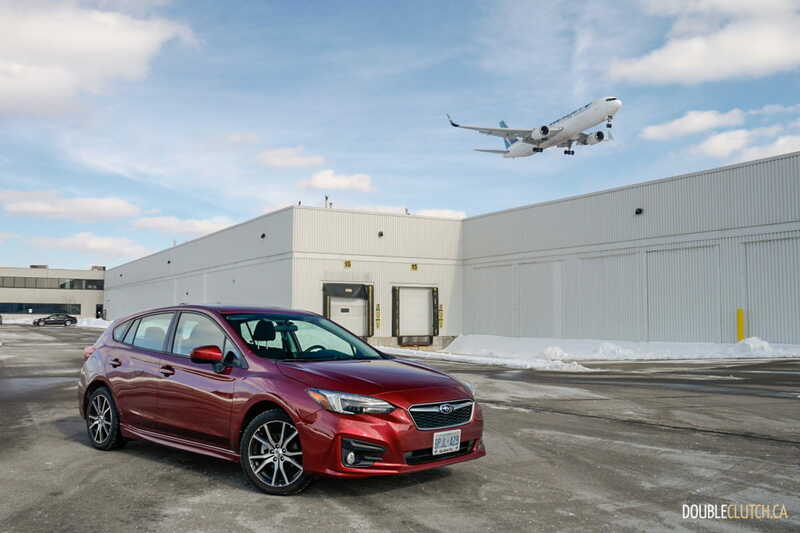 Subaru updated the fifth-generation Impreza with the new Subaru Global Platform (SGP) in 2017, vastly improving handling abilities. 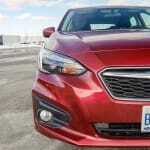 The Impreza feels stable on the highway, and remains planted with minimal body roll when the roads get twisty. 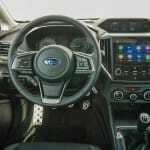 As with any Subarus not named BRZ, all-season traction is never a concern and the all-wheel-drive system continues to be a main selling point for the brand in the markets with colder climates. 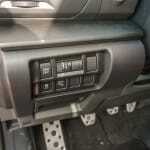 The electronic steering rack feels quick and nimble in the city, with good road feel transmitted to the driver. 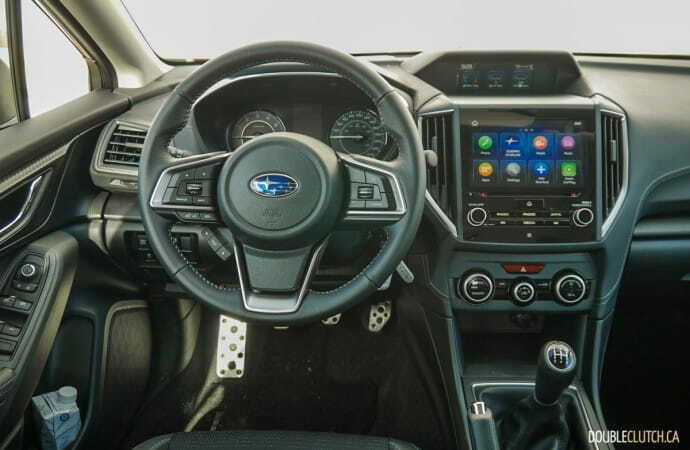 The downside to having fast steering is that the Impreza does get twitchy at higher speeds, but given its short gearing, the Impreza Sport is best used in the city anyways and those looking for a grand tourer should look elsewhere. 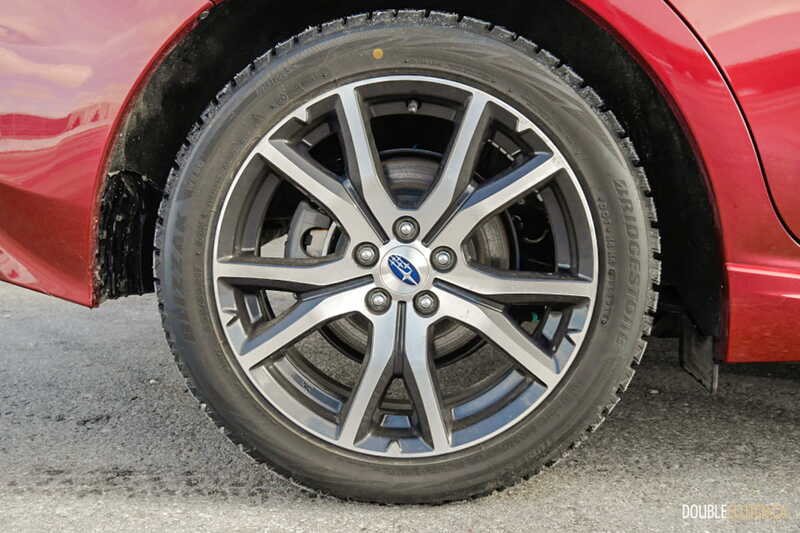 The Impreza Sport’s turning radius is relatively tight, requiring no more space than average for most U-turns in the city. 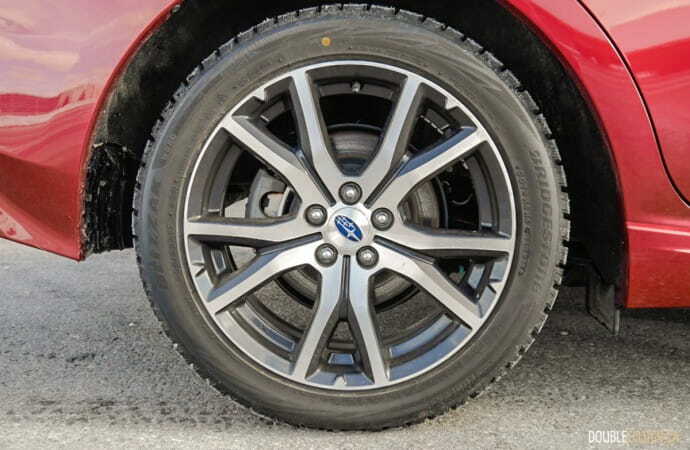 The Impreza Sport’s short gear ratios and the lack of a sixth gear also means slightly worse highway fuel consumption than its competitors. 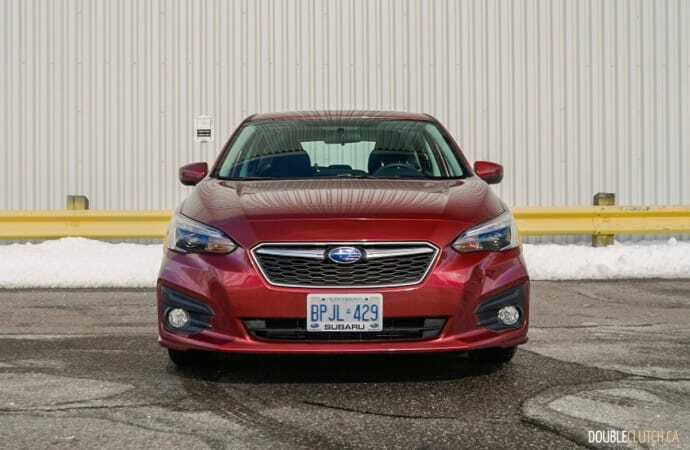 Cruising at highway speeds in fifth gear has the Impreza Sport’s engine holding close to 3,000 revs per minute, higher than six-speed rivals such as the Toyota Corolla Hatchback. 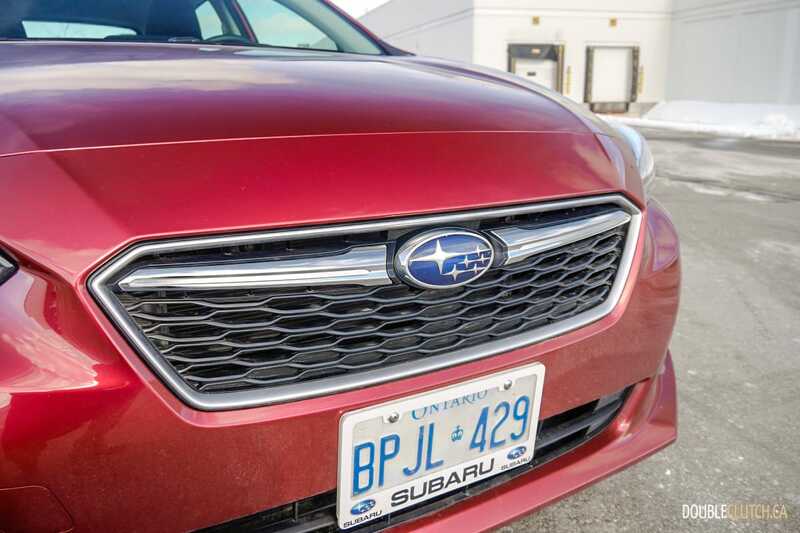 Subaru claims 10.1L/100km city and 7.7L/100km on the highway, and we observed 8.7L/100km over a week’s worth of testing including a jaunt to Niagara Falls. 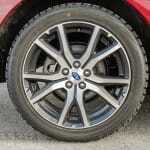 Interior appointments in the Impreza follow a similar utilitarian approach. The heated front seats are comfortable, and we observed a fair amount of head and legroom in the rear. The rear bench is a bit on the short side and lacks some thigh support, but is roomy enough to not feel uncomfortable. 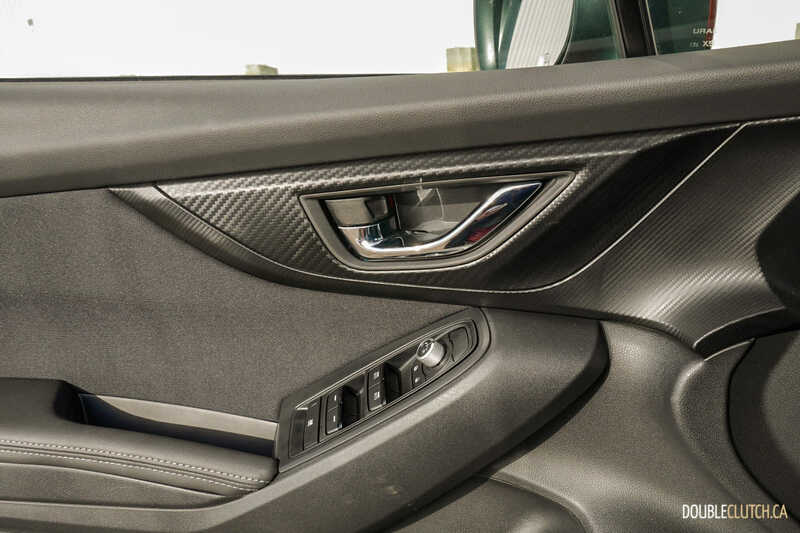 Interior materials have improved a lot in this current generation, with fewer plastic materials laid around the cabin. The steering wheel and shift knob are leather wrapped, adding a touch of class to the practical interior. 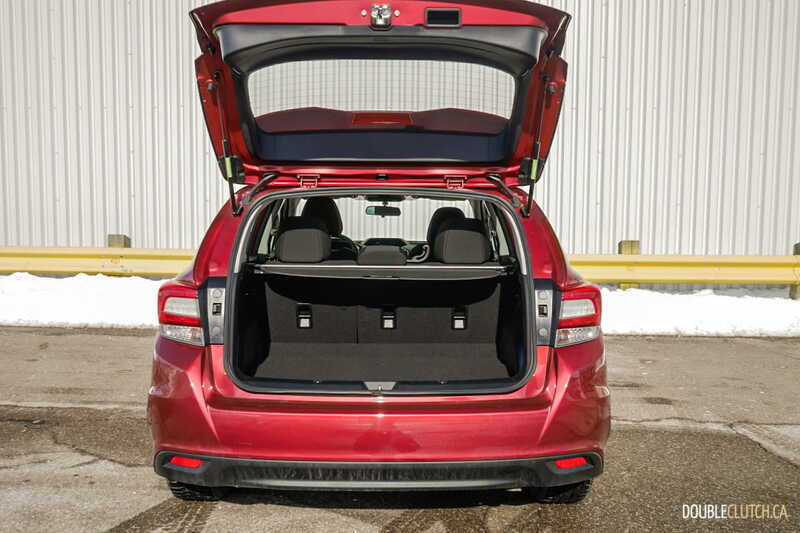 The Impreza 5-door will hold 589L of cargo behind the rear seats. 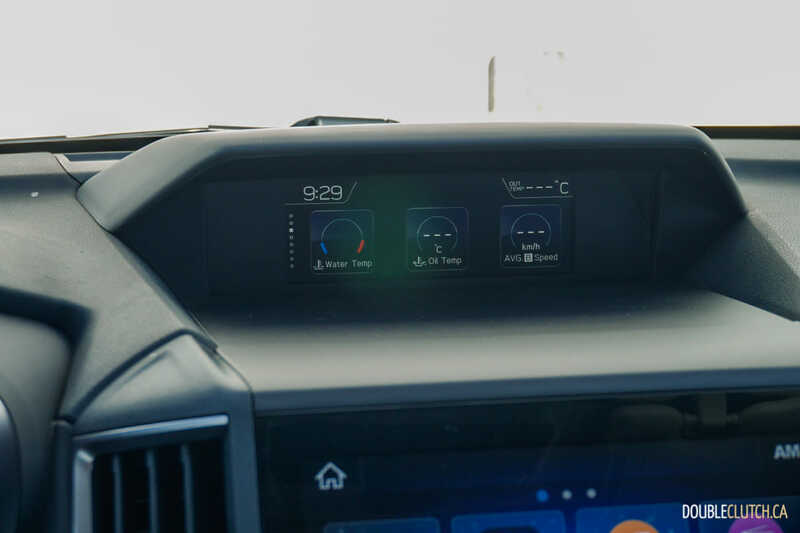 Infotainment is controlled by an eight-inch STARLINK touchscreen, with additional information such as fuel data, eco-guide, vehicle gauges, clock, or temperature displayed on the 6.3” colour display atop the main infotainment system. 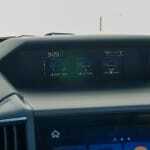 Graphics are vivid and the system is quick to respond to touch commands, and there is a helpful cluster of physical shortcut keys below. Apple CarPlay and Android Auto are both supported, and the six-speaker sound system’s quality is about average for the segment. 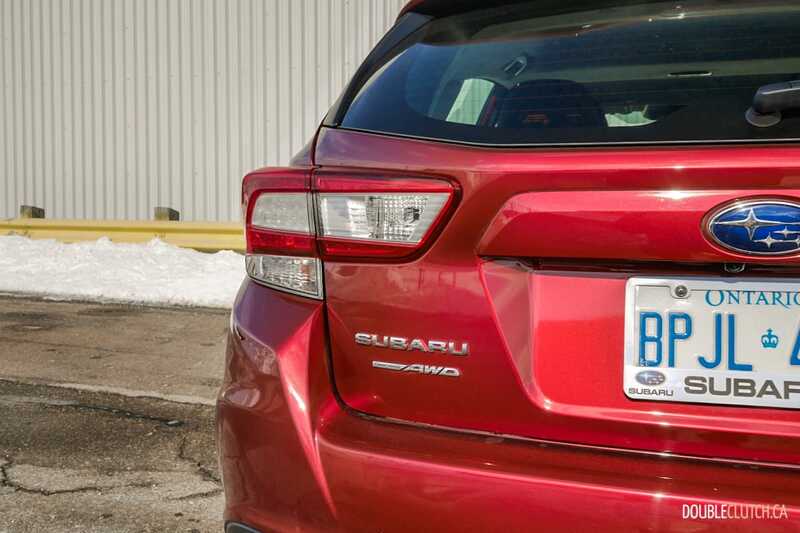 The Subaru Impreza Sport is equipped with standard blind-spot detection and rear cross-traffic alert system to assist drivers. 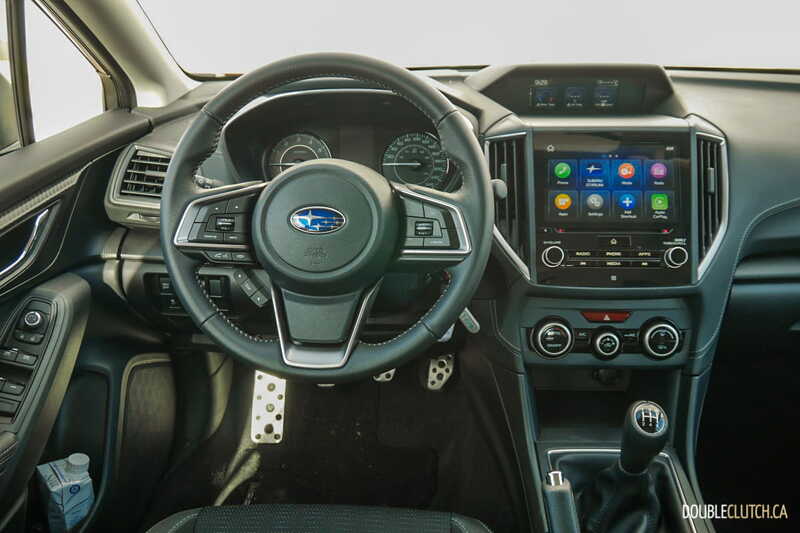 Unfortunately, to equip the Subaru Impreza Sport with a class-leading EyeSight safety system (pre-collision throttle management, pre-collision braking and brake assist systems, lane departure warning, lane keep assist, adaptive cruise control) will require buyers to forego the manual option for the CVT. 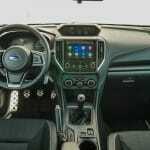 That is a glaring omission in the face of some newer competitors such as the Mazda3 and Toyota Corolla Hatchback that can be equipped with these safety features regardless of transmission choice. 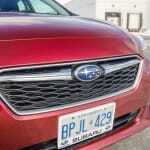 Pricing of the Impreza 5-door starts at $20,895, with the as-tested Sport model at $25,395. The Sport model adds the LED head and daytime running lights, power sunroof, 17” wheels, eight-inch infotainment system, power driver’s seat, and some other interior trim upgrades to the base model Impreza 5-door. 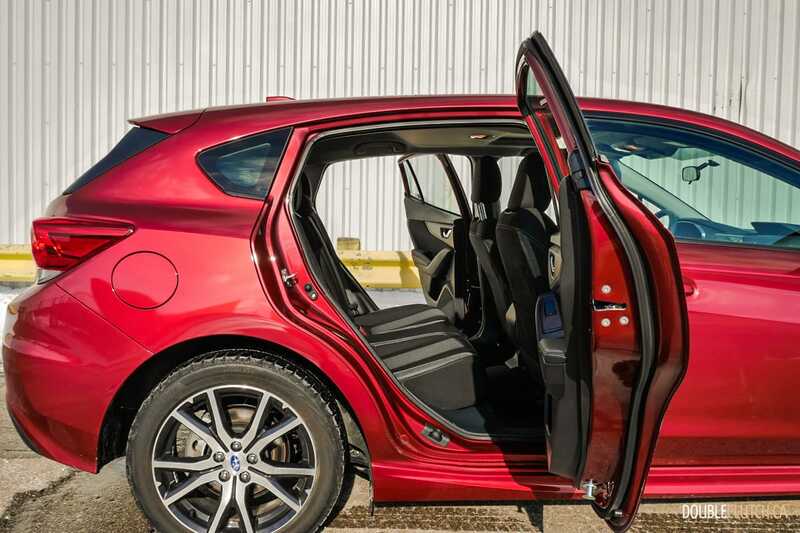 There are a six trim levels for each of the Impreza models, offering a wide range of options to fit everyone’s budget. 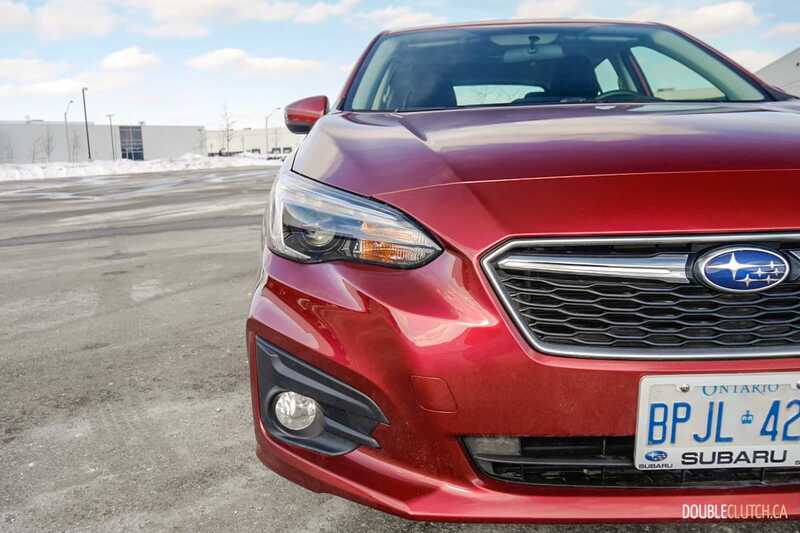 The 2019 Subaru Impreza Sport 5-door is a solid, no-nonsense choice for Canadians looking for an all-weather compact hatchback. 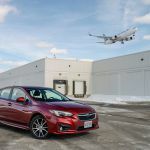 Its driving dynamics and winter driving capability are at the top in the compact car segment, but with new models coming to the market this year, the Impreza will need a few updates along the way if it wants to continue its sales success.